The term "blue" refers to the gray-blue colour also known as gray or "Maltese." This neutral tone takes on different tints at different times, sometimes appearing bluish or almost lavender. The apparent tint is affected by variation in coat shade and texture, as well as variation in lighting and background. Blue cats can be difficult to photograph accurately! One of the most appealing features of this cat is the built-in smile caused by the round prominent whisker pads. This smile was never displayed better than in Lewis Carroll's Cheshire cat; originally a tabby British Shorthair. A very sturdy and strong cat with a body shape that is almost square, since they are almost as broad as they are long in length. Like a bull dog, a British Blue Shorthair has thick, short legs on a heavily muscled body. With broad shoulders and powerful hips, the British is affectionately referred as the body builder or bull dog of the cat fancy. While the male British is noticeably larger, broader and rounder than the female, both male and female British Short-hairs are an imposing cat presence. Growing very slowly, a British Blue Shorthair does not reach full maturity until four to five years of age. The head of a British Shorthair is very massive, broad, and round. Chubby cheeks give the British Shorthair a chipmunk appearance, and large, brilliant copper eyes are prominent facial features. Medium to small sized ears with rounded tips are set wide apart on the domed tophead. A snub nose on a short wide muzzle, with firm, slightly rounded chin emphasizes the roundness to the head and powerful jaw. The coat of a British Shorthair is unique. No other breed of cat has the thick plush, well bodied coat of the British. 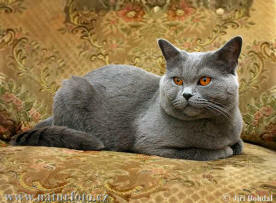 With the texture and density of lush rich velvet, a British Shorthair feels like a sheered lamb or a rich Persian carpet. The thick, naturally protective short hair of a British seldom sheds if living quarters are kept cool and hand grooming (petting) is done on a regular basis. British Shorthairs don't like water, but will accept the indignity of a bath provided it is done with tender loving care. The blue colour of a British Shorthair can range from a pale light silver to a dark charcoal, with the lighter shades being preferred. The colour should be solid and even throughout the body, with ghost tabby rings on the tail allowed only in immature specimens. A blue British Shorthair must have deep copper eyes that are large and round, giving the British a sweet, open expression. Just because the British Shorthair is a big, massive cat, it does not mean it is a fat cat. A British Shorthair should be the same width at the shoulder as at the hips. Their body should not pouch out or cave in. They should have a firm tummy, that does not sag or wiggle. Sound muscular body type is obtained through sound genetics, quality food, and plenty of exercise. Temperament: British Shorthairs are very affectionate, quietly following you from room to room until they can settle contentedly by your side. Gifted with lasting patience and confidence, Brits are especially good with children and other types of pets. A moderately active cat, they are not destructive as a breed, adapting well to any size household. British are very easy going and are affectionate to numerous people in the circle they consider family. Most breeders recommend feeding a British a high-quality dry food. Care must be taken to not allow your British Shorthair to get fat, or its life span will be shortened. Middle-aged cats (5-10) are most likely to have weight problems which can usually be controlled by switching to a low-calorie food. Feed controlled portions once or twice a day; if your cat seems to be overly heavy, ask your vet for more specific advice. The British Blue can be regarded as the feline equivalent of the British Bulldog. Worldwide, where there are pedigree cats and those who love and admire them, the British Blue stands as the symbol of the United Kingdom. A large muscular, working cat, the British Blue is the refinement of the natural domestic shorthair that has said to have inhabited Britain since the time of the Romans. The British Blue has mutated in colour by cross breeding. Now you can find anything from calico to a copper colour.